Classic, modern, glamourous. Black and gold is classic color combination that leaves you feeling as if you just stepped off the red carpet. Driving up The Duke Mansion, you're filled with feelings of luxury, sophistication, and class. It's no wonder that it is one of the top venues in Charlotte. The invitation suite, created by Blush & Blue Calligraphy, featured intricate gold calligraphy and a gold, hand drawn image of the Duke Mansion, on white and black paper. A fanback gold settee from Evermore Event Company created a perfect golden, classic seating area for the bride and groom. For the florals, we wanted to create natural pieces that elevated the theme throughout. Emily from Julep Floral created very elegant, modern floral elements with mixtures of greenery, white, and dark plum flowers. 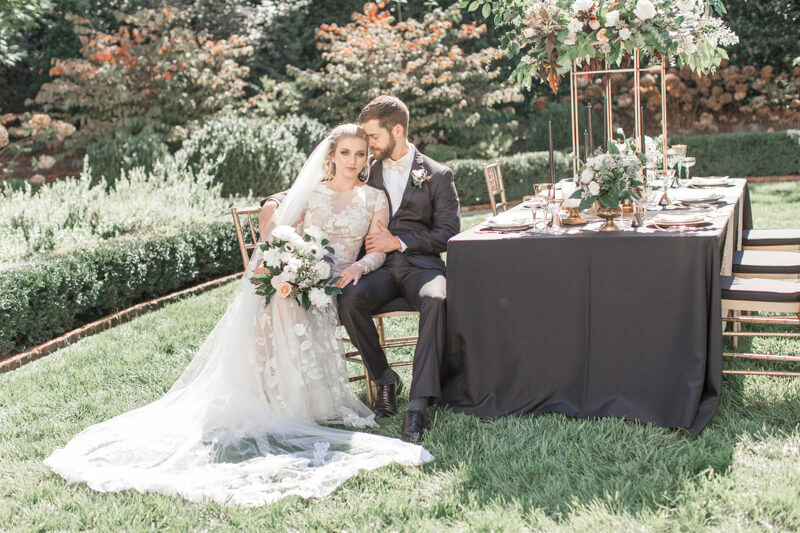 The gown, provided by Hayden Olivia Bridal, was Brielle, an elegant, lace piece from Callie Tein's Muse collection. This balanced the classic theme with a feel of modern luxury alongside the long, flowing Annie Veil by Sara Gabriel. 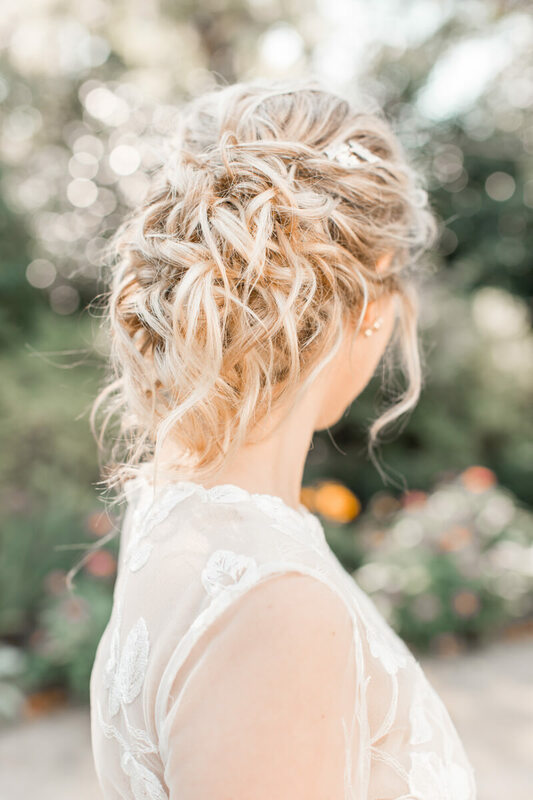 Inspiration for this shoot came from wanting a mix of classic, yet modern with hints of Hollywood glam. 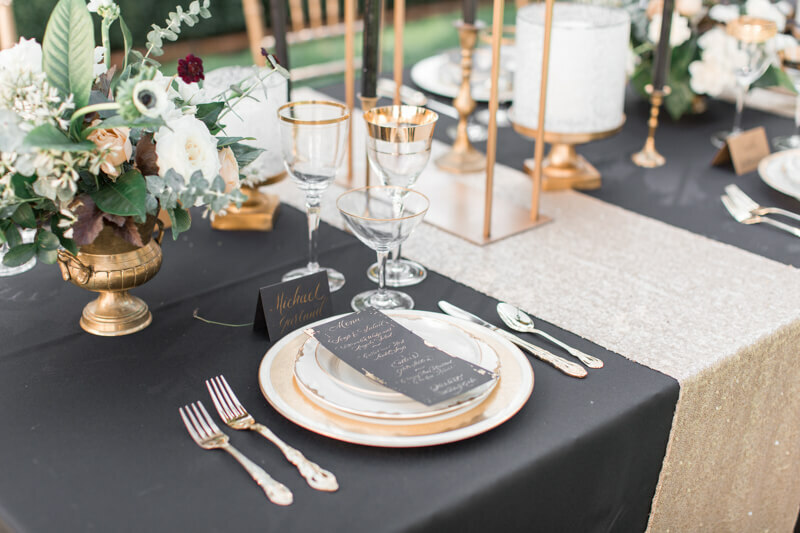 Black linens with champagne gold sequins runners strategically placed vertically create feeling of uniqueness, and sophistication. Gold chivari chairs added to the theme alongside elegant, white and gold china, and tall, dark taper candles. The cake, featuring black fondant and an intricate gold leaf design, carried the theme of classic luxury and modern glamour. Champagne gold bridesmaid dresses matched the table runners and added a mix of Hollywood glam. Black and gold, classic and modern, glamorous and sophisticated. When deciding whether you want a classic or modern wedding, it is okay to go with both.